In all of my articles I always advise you to test water before you actually buy any filter, as filter needs to suit your specific needs. I have never told you how to test water quality. I have decided to fix this mistake and in this article we are going to have a look at different ways of testing water. I will cover the whole topic more in depth, but here is the short answer. Fill the glass and use your senses to smell and visually check the water on the presence of contaminants. You can check the shade of water by putting a white paper behind the glass and compare the shade of white. To test water for invisible impurities, you can invest into testing strips and for the most comprehensive test simply send the sample to the lab. At the end I am going to have a look and advise you on how you can actually have your water tested in the lab. I am well excited about this article and I think it will give you a lot of value. So, without any further delay, let’s get started. Why Is It Important To Test Water! How Often You Should Test Water In The Lab? The quality of water is affected by many different reasons. This can be due to development of cities, contaminants released into rivers and lakes, or poor conditions of water supply network. To be fair, water is so sensitive that you can name almost any reason and it will have the impact on it. Most of the contaminants are dissolved in water so you’re not able to see them. For this reason, it’s important to test quality to know what contaminants are present in water you drink. There is also a myth, that people using well as the main supply have a clean and safe water. Even well water is not as safe as you want to believe. Well water can be exposed to many different contaminants such as pesticides from soil and sediments from the ground which make water hard. You should test water to know if any of the contaminants present in it are dangerous to your health and also when selecting water filter to protect yourself. Click here to read my ultimate guide to water filters in 2019. It doesn’t really matter what water you’re testing at home. Whether it’s well water or a city supplied water you will never be able to get exact results in home conditions. If you want to know what exactly is in your water and in what amount, you’ll have to test it in the lab. What you need to know for now is that testing water at home will tell you roughly what water contains. However, there are certain tests you can do yourself, which I am going to cover now. Smell and taste are first hints that show us if something isn’t right with water. The simplest experiment to check the quality of water is evaluation by senses the God has given you. Water needs to be crystal clear without any taste and any chemical or other smell. If your water tastes funny or smells funny then it’s likely that something isn’t right. If water has a bitter taste it means that it contains magnesium salts, if it has a tart taste it contains iron. Musty or rotten taste usually indicate the presence of decay from plants or animal organisms. So please take it as a first hint! Drinking water should be a colorless liquid, so here are simple tricks on how you can check if the colour of water is alright. Pour water in a clear glass and put it on a white paper or just put the paper behind the glass. Now, review water in a glass from different angles, and make sure the light is bright enough. Water shouldn’t contain any sort of sediment, and paper under/behind the glass should have the same white colour as outside. If water has slightly yellowish colour, it means that it is likely to contain iron. For this test you will need a tiny piece of glass. Glasses will do. Make sure it’s clean without any dust on it. Drop one drop of water on this piece of glass and leave it to dry out. Inspect the spot where water was and see if there is any kind of sign of dirt on it. You won’t be able to test water for bacteria at home and tell exactly what kind of a bacteria it has. However, there are some hints that might point you out in the right direction. 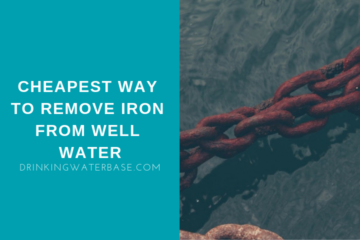 Bacteria are emitting the iron and sulphur into water so, if your water is yellowish and contains iron it might be iron or sulphur bacteria in it. Another thing you can notice is, that the presence of bacteria, can create biological film inside plumbing pipes. Another tip would be for people that have an aquarium. Fishes are very sensitive on a quality of water so, simply have a look into the aquarium if fishes are happy, you get the idea. Apart from that I am not aware of any other signs that show you that the bacteria is present in water. If you have any other tips, make sure to share them in the comment section. For truly precise results you will need to get it tested. I will talk about it in a second. Also, click here to check out one of my other articles about bacteria in water and ways to kills them. I was talking extensively about hard water in my other article so, to get more information make sure you check it out. For this reason I’m not going into much details about what is hard water and why is it bad. I just jump straight onto it and talk about how to test hardness of water at home. It’s a simple test and you can do it yourself without any specific instruments. For this test you will need warm water and some soap. Trust me, it’s really fascinating experiment. Try to foam water with the soap. If water foams badly, you have hard water. Also, water is hard when during boiling it forms a sediment on the bottom of your appliances, make sure you check them out. Even if your water passed initial tests mentioned above, don’t get too excited as there is still long list of invisible for eyes contaminants. All these experiments can be fun doing with kids, but for better results I would advise you to get test strips. There are different types of testing strips in a kit and usually you can check different contaminants such as lead, iron, pesticides, bacteria, chlorine, alkalinity or hardness of water. 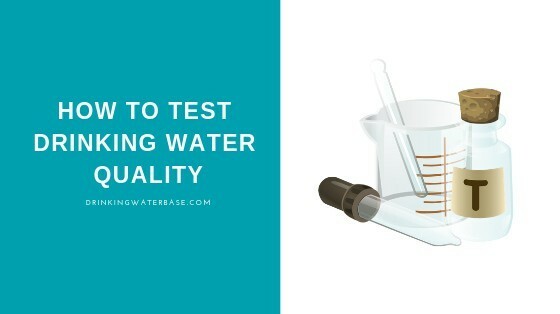 If you are looking for inexpensive and quite good way to test your water, I would definitely suggest you investing into testing kit. Click here to check out the price on the one I recommend. It’s a test kit that comes with 10 separate tests and you will also receive the TDS meter. To begin with, I need to tell you that TDS meter measure water hardness and not contaminants present in water. The acronym TDS states for Total Dissolved Solids and it measures solids such as salts and minerals of magnesium, calcium and potassium in water. TDS meter is a good way to tell whether you need a water softener or not, but it’s not a good way to measure contaminants present in water. Most of the contaminants I’m talking about on this website are not going to be picked by the reader. These are the following: pesticides, pharmaceuticals, arsenic, lead or iron and list goes on. Many people are confused when they are using TDS metre to measure the performance of their water filters. Apart from reverse osmosis and water softeners most filters do not remove salt solids from water. Therefore, you won’t be able to see the performance of the filter on your TDS meter before and after testing and you will see only slight drop in TDS. If you want to see the real performance of your filter I would suggest you to go back to testing kit instead of TDS reader. This section is dedicated for people that truly want to know the quality of their water and what kind of a filter will be the most suitable for them. Who is the lab test for? Especially people moving into new house or if you just drill a new well the comprehensive lab test will answer all your concerns. Apart from that people who just want to know what is in their water would also benefit from this test. You simply purchase a special kit and collect the sample of water from your house. Then you send it to laboratory and wait for results. There is a kit that I would recommend. The lab test includes over 200 contaminants and is also certified by EPA. On top of that you receive a free return shipping to send water samples with UPS so you don’t have to pay the shipping cost yourself. As a bonus this test includes free do-it-yourself bacteria test you can conduct at home. What I really liked about this test is also the fact that you can call the company and talk with a certified specialist about your water results. I think this is a great service. The test is called Safe Home Ultimate test. Make sure to check it out on Amazon. I am sure you will like the service provided. The test usually takes up to 2 weeks to conduct and results will be sent to you via email in the easy to understand form. As I have said earlier you need to collect samples of water. Next chapter is dedicated to this topic to make sure you didn’t waste your money just because of poorly collected samples. The thing is, there are many places in your house that can the impact on the water quality. What I mean is, that if you truly want to know the quality of water that is coming from the source, you need to make sure the sample is not distorted. For this reason I will describe certain steps you could make to ensure to minimize the distortion. 1. I am assuming that you will take water from the tap. First thing you should do is to take off the aerator from the faucet. 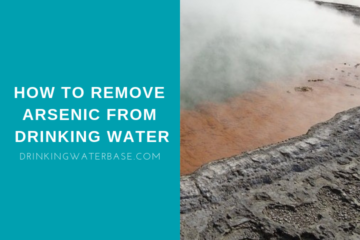 This is needed because the aerator can become a great breeding ground for bacteria. Especially, those small folds at the connection. 2. Now you can use fire or alcohol to disinfect the end of the faucet. This step is related to the previous one. Use the lighter to heat up the end of the faucet or use the spirit and wipe it properly. There is no harm of doing both, only be careful not to burn the house. 3. Let the cold water run for about 5-10 minutes on the maximum flow. By doing that you will ensure that all the contaminants from the house plumbing will be pushed out, and water quality will be similar to the source water. 4. Another step you should make is, to wash your hands with soap and ensure they are clean. Now it’s a time to collect water samples. 5. Use the container provided by the lab and pour water in. In case you use home testing kit, you can use disinfected glass and pour it with water. 6. Ensure to seal the container properly as advised by the instruction and send it the same day back to lab. These are the general rules you should follow. Make sure to read and follow the instruction enclosed in the testing kit you have received from the lab. I believe it is easier to watch than explain so here is the video with same steps. One last topic we need to discuss to complete this comprehensive guide. There is definitely no need to test water in the lab frequently. It is not beneficial financially. It is an expensive test! There are however, couple of occasions when I would test water in the lab. I would definitely test water when moving into the new area and house. If you have drilled the new well, it would also be a great idea to test it. If there was some major infrastructure work in you area that might have affected water quality. If water has changed the taste or color and the problem persists for a longer period. With the last two points, I would contact the local water authority first, before conducting the lab test and use the test strips. We have reached the end of this article. I would be really happy if you ask any questions and concerns that you have about the water testing in the comment section below! Have you tested water in the lab and what was found in it? When was the last time you have tested water? Make sure to answer below and share the article with your friends.